The Gunners have been restricted to loan moves for the month and this has limited their chances of signing top-class recruits before the deadline. Still, the club are making progress towards temporary deals for Ivan Perisic and Denis Suarez and Emery has confirmed that at least two players are on the club's radar without mentioning the names. "We are looking at two different players and the possibility they can come. If they aren't coming to help us like we want, I prefer they don't come," he said before the Cardiff City clash. Arsenal have been weakened further with both Laurent Koscielny and Sokratis sidelined with injuries for the Bluebirds' game and the latter has been ruled out for at least two weeks with an ankle problem. 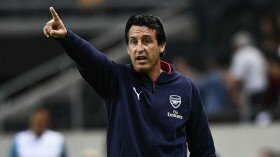 Despite this, Emery has suggested that the club may not necessarily strengthen the central defence this month but would be pleased with forward reinforcements before the deadline approaches.